Students can now apply for federal financial aid the same way they share snaps and stories: through an app on their phones. 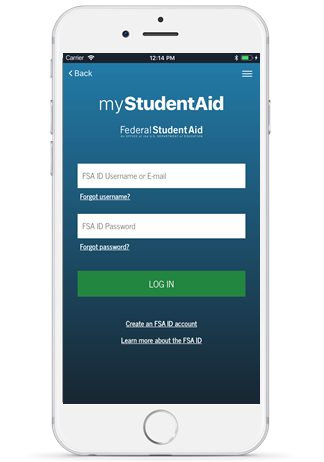 The myStudentAid mobile app from the U.S. Department of Education lets students and parents fill out and submit the Free Application for Federal Student Aid, or FAFSA. The new app launched Oct. 1, the opening day for submitting the FAFSA for the 2019-20 academic year. The results of the FAFSA determine a student’s eligibility for grants, scholarships and work-study. It’s also the key to accessing federal student loans. Students must complete a FAFSA for each year they’re in college to receive financial aid. “We’re hoping that the availability of the app really attracts students since students are so centered on doing all of their tasks on their phone,” says Kim Cook, executive director of National College Access Network. The organization, a nonprofit dedicated to improving access to college for first-generation, underrepresented and low-income students, tested the app’s beta version earlier this year. The application questions are the same, though now they appear one screen at a time. Cook says students responded positively to the simplified format during NCAN’s testing. MyStudentAid isn’t without its limitations. According to the Department of Education, you’ll still need to use the FAFSA website for certain functions. For now, the app is only available to first-time 2019-20 applicants, so you can’t file a renewal application if you’re currently in college. You also can’t file a correction through the app if you make a mistake or need to amend your form after submitting it. Manage your FSA ID and password. Use the myCollegeScorecard feature to compare colleges’ graduation rates and average student debt per graduate. Ask Federal Student Aid representatives questions about your application. Use the IRS Data Retrieval Tool to transfer federal tax return information to the form. Access federal student aid history using the myFederalLoans feature. Get financial aid information directly from the Federal Student Aid website through the app. Residents of seven states — Iowa, Minnesota, Mississippi, New Jersey, New York, Pennsylvania and Vermont — may also transfer FAFSA information into their state aid application using the mobile app. The deadline for the 2019-20 FAFSA is June 30, 2020. But the sooner you submit, the better the chance you have to secure first-come, first served aid such as Pell Grants and work-study that will help limit how much you need to borrow in student loans. Before you apply, prepare to complete the form with less stress by having all the documents you need at your fingertips. This checklist can help. The myStudentAid mobile app is available now for iOS and Android devices. Anna Helhoski is a writer at NerdWallet. Email: anna@nerdwallet.com. Twitter: @AnnaHelhoski. The article Ready to Apply for College Aid? A New App’s on Tap originally appeared on NerdWallet.